It’s no secret that beauty emanates from within. Not only does inner beauty reflect outwards, but our nutritional health has a lot to do with achieving the physical characteristics we covet– like beautiful, healthy hair. Regardless of what your go-to products are, there is nothing better than working from the inside out in terms of getting your strongest, shiniest locks. Foods that are high in Vitamin A include carrots, sweet potato, tuna and dark leafy greens. 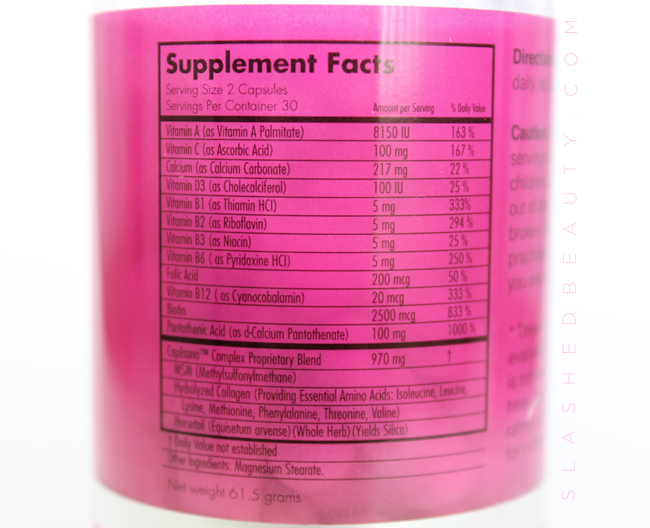 B7 (aka biotin): increases elasticity, fights dryness, and helps produce keratin and thicken the hair. Foods that are high in B vitamins include dairy products, lean meats, leafy greens, eggs, fish and fruits. While many of these foods overlap, it can be hard trying to rework your entire diet to fit in the right amount of vitamins for healthy hair. Last month, I cut about five inches off my hair with the goal to grow it back much healthier. I started taking Hairfinity– a pill that targets healthy hair– right after the chop with the hope that it would help my hair grow long and strong. It’s been filling in the gaps in my diet to give me the vitamins my hair has been craving! 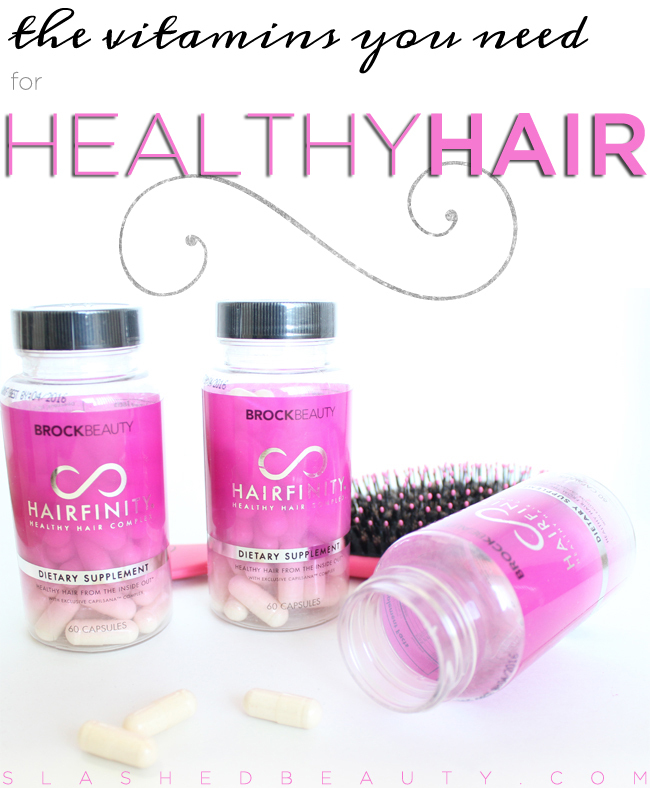 Hairfinity is a nutritional supplement that contains the essential nutrients for healthy hair, including Vitamins A, C, and D, a B-Vitamin Complex, Biotin, and MSM. It’s been clinically proven to increase the hair growth rate by 155% while decreasing shedding. The best part is: most of the vitamins in Hairfinity do double duty to help your overall health and solve other beauty problems (like skin concerns). After one month of dramatically increasing my vitamin intake by taking two Hairfinity capsules a day, there’s a noticeable difference in my hair length and overall health. 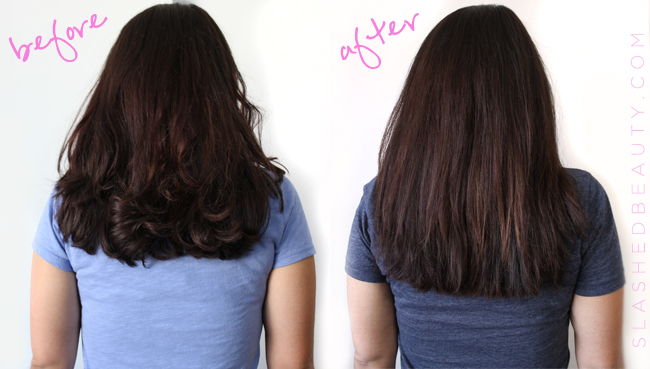 While I’ve always suffered slow-growing hair, it’s already about two inches longer than when I first cut it! I’ve never had it grow that fast, which is a good thing because I wasn’t necessarily loving the length it was cut to at first. Another big improvement I’ve seen is the reduced shedding I’m experiencing, both in and out of the shower. I’ve always had thick hair but prior to taking vitamins, I would leave a trail of hair behind me everywhere I went (it drove Adam crazy). Now, I feel like I’m shedding about one-fourth of what I was before. Even in my brush, I’m seeing a lot less hair left behind. Healthy living and providing your body with the vitamins it needs not only improves your general well being, but will reflect in your physical appearance. How do you work vitamins into your lifestyle?